Browse: Home / 2016 NMF: we were there! 2016 NMF: we were there! Our Society was a very active participant at the NMF. On Saturday 13 February our great choir Dante Musica Viva – conducted by Francesco Sofo –performed on the stage located within the European Union compound in City Walk. Our repertoire included two opera arias, folk and regional songs and was well received. Our Ambassador Pier Francesco Zazo came to listen to us for a while. 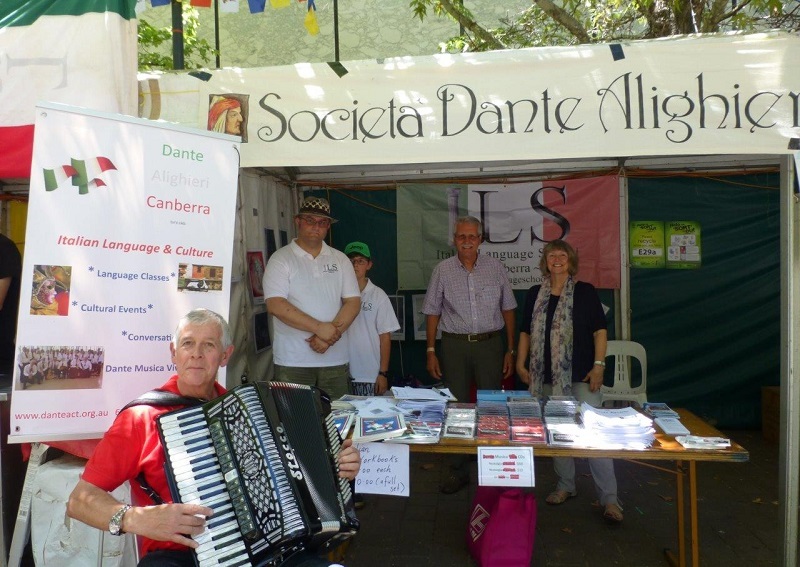 On Sunday 14 the Dante had an information stall (shared with the Italian Language School and the Tesorini – an Italian playgroup for smaller children) located in the Italian Piazza right in the centre of City Walk. 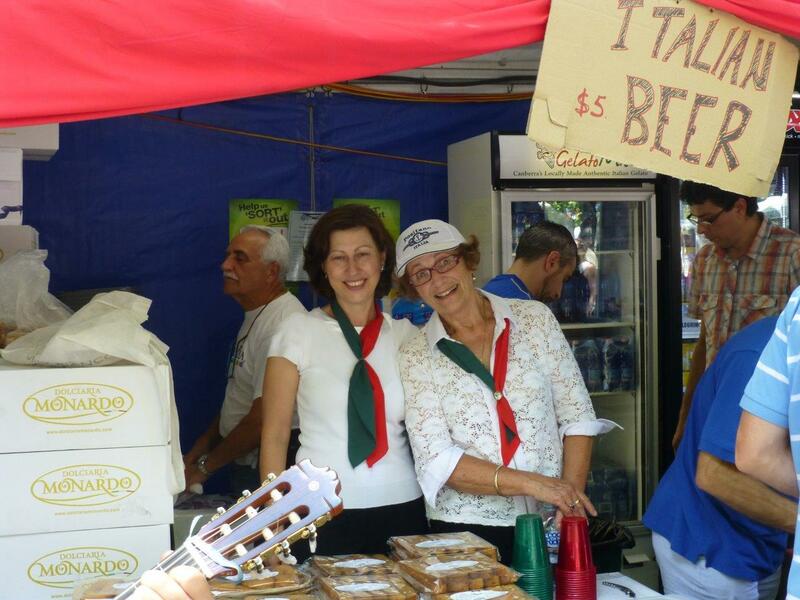 Grouped together for the two-and-a-half days were Italian associations and organisations selling sausages, biscuits, pastries (including cannoli siciliani), gelato, coffee, antipasto, aperitifs, wine and soft drinks. A long Italian flag was draped over these commercial outlets while we hung our Society’s banner on our stall. Our committee members Franco Papandrea, Alessia La Cavera, Luigi Catizone, Nicola Patini and Bruno Santagostino spent a lot of time working at these fund-raising stalls, with part of the proceeds flowing to the Dante. Franco valiantly spent most of the two days enticing people to buy Italian biscuits! Mario Rosi spent a few hours at our information stall on the Sunday, while Committee member Tamsin Hong and choir members Ondina and Elda took turns on the Saturday. 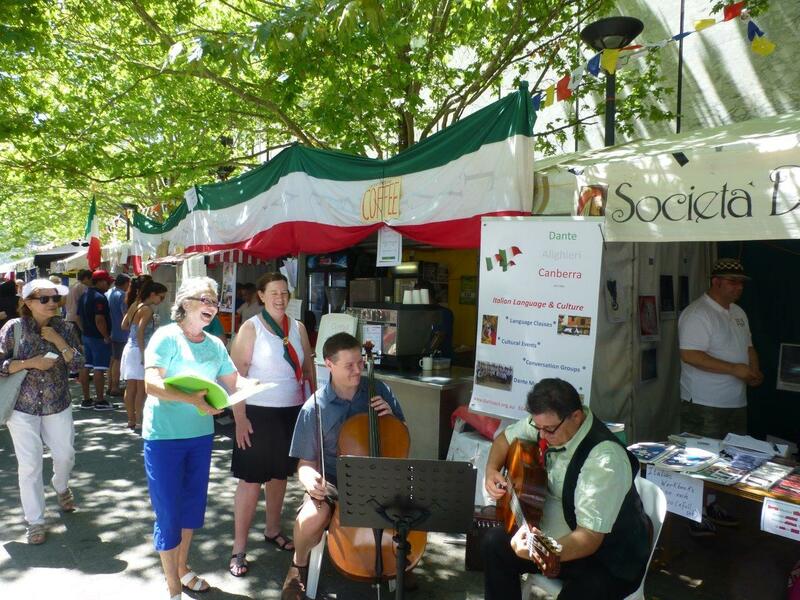 Two choir members who also play musical instruments (Matthew the cello and Rodolfo the guitar) came on both days to play Italian pieces outside our stall. Our multi-skilled Treasurer Mario Rosi also came on both days to play his piano accordion – which attracted a lot of passers-by including a few young people! Bravi tutti! Some choir singers (Patricia, Elda, Ondina and Margaret) also came for a while and sang some of the pieces played by Matthew and Rod. On Sunday a passer– by with a great tenor voice joined us in O’ sole mio, and Eirlys Chessa (an old choir member) who happened to be passing by, stopped to sing Bella Ciao with Margaret and me. Right in front of our Piazza Italiana there were Latin-American bands playing all day Saturday and Sunday. As a result, our own musical offerings had to be scheduled to coincide with the breaks taken by these bands. 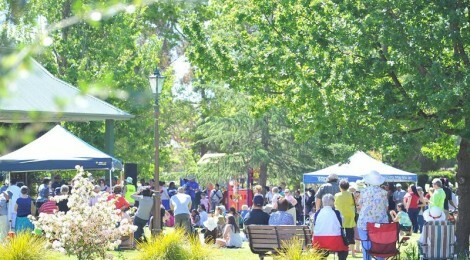 But it all turned out well in the end and everyone seemed to enjoy this 20th edition of the festival which, according to estimates published in The Canberra Times, attracted 280,000 people –about 70% of the population of Canberra!